Discussion Forum: TW 6.5 v (latest) fast spin of tours???? Topic: TW 6.5 v (latest) fast spin of tours???? Thanks very much! we have tested it and found that it is a problem . Our developer is fixing this problem. Thank for your helpful suggestion. Do you know when this problem is solved? Now I have 2 version of TW (6 and 7), which I cant use. You can download the zip file from here and then release it . 3.Copy all the four files and paste to the file in the " resource"
I have replaced the files, and speed problem is solved. You are welcome .Thank for your helpful suggestion and testing. 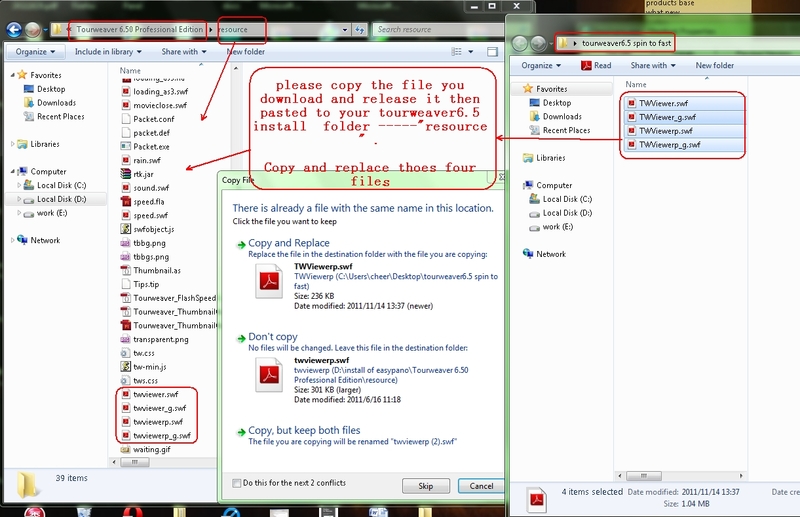 For new users , I have uploaded a new version of Tourweaver6.5 which fixed this problem. The builder is Tourweaver6.50 .111116 .